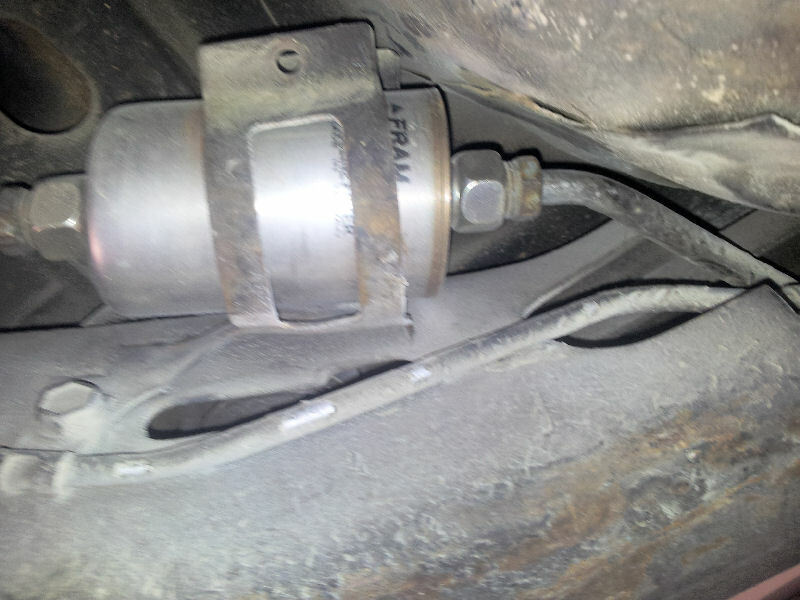 If one is not familiar with the fuel filter location, it can be a bit time consuming to find as it is tucked up inside the frame rail about two feet in front of the driver's side rear wheel behind a dropped down portion of the floor pan. As the picture shows, there is not a lot of access room to the front fitting. It is a good idea to change the filter once a year because a dirty filter can substantially restrict flow leading to a loss of necessary fuel pressure under boost. When I replaced this one, I used an ACDelco GF652 which is the current number. The Fram number is G3727 and Wix is 33481. Price usually varies between $8-10.00. When you get the filter off, you will find that each fitting has a small o-ring on it. With age, you may prevent a leak if you replace the o-rings (GM#22514722 or Standard Brand #SK26 (box of 10)) These are common between various GM cars and the parts store should be able to cross them over to BWD, Niehoff, or whatever. Even if the car has been serviced regularly, it never hurts to spray the fittings with some rust penetrant or WD-40 an hour or so before you change it. I use a 5/8" wrench on the fittings while holding the filter side of the connection with a 20mm, 25/32" or 13/16" wrench...whatever fits the tightest out of your selection. It goes without saving that using a quality tubing wrench is the best to use on the line fittings. Remove the screw in the bracket so you can get the old filter out once everything is loose. Now, if the lines are pressurized, you can get an eyeful of gasoline in short order when you crack the fittings. If the car has not been sitting for awhile, disconnect the fuel pump connector and start the engine and it will stop when the fuel pressure goes down. Reconnect the pump before you forget it. It will still have some pressure so be ready with a shop towel or a pan to catch what comes out. If doing this on the floor with the car jacked up a little, don't lay under it at this time. Reach under and crack the fittings. I may be getting old, but this unleaded gas seems to burn a lot more than the old gas did. Given that these fittings seal with o-rings, there is no need to shorten their life by using all the torque you can muster when you put the new one on. Just use enough to tighten them without going nuts. Point the flow direction arrow on the filter toward the front of the car. As you can see by the picture, I don't live in a bad rust area. If you do, and the filter was not routinely changed by the prior owner, you may be in for a real job when it comes to breaking the fittings loose. Soak them several times with AeroKoil or PB Blaster over a period of days before you get serious about changing it. Use good wrenches, not HF one size tends to fit a bunch of stuff. If, by some stroke of bad luck, you end up twisting the line(s) off, then you will have to use something like a Dorman fuel line repair kit to fix them. Don't use a cutting torch no matter how badly you want to!